Gonzo's Quest Video Slot Review - Casino Answers! Gonzo’s Quest is a 5-reel, 20-line video slot developed by Net Entertainment, featuring a wild symbol, cascading symbols, multipliers and a free spins feature. You can play the Gonzo’s Quest video slot at Bovada. Coin values on the Gonzo’s Quest slot machine are $0.01, $0.05, $0.10, $0.25, $0.50 and $1. You can select up to 20 paylines at 1-5 coins per line. You can bet anywhere from the minimum total bet of a penny per spin up to the maximum total bet of $100 per spin. Gonzo’s Quest has a good betting range and is suitable for most online slots players. 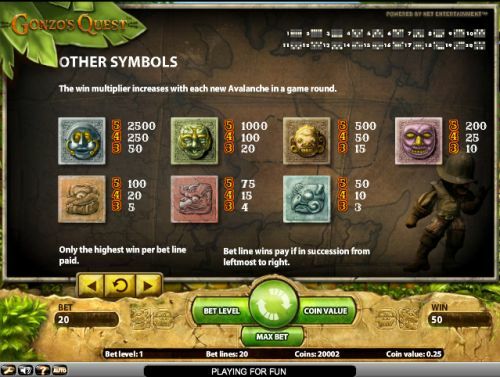 To play the Gonzo’s Quest online slot, select your bet and press the Spin button. To play all 20 lines at 5 coins per line, you can also press the “Max Bet” button to spin the reels. The Moon symbol is the highest paying symbol on the Gonzo’s Quest slot game. If you hit 5 Moon symbols on an active payline, you will win the 2500 coin top jackpot. The second highest paying symbol on the Gonzo’s Quest video slot is the Fire symbol, which can pay up to 1000 coins. The Question Mark symbol is the Gonzo’s Quest wild symbol. It will substitute for any symbol in the slot game. Hit these jackpots to win big on the Gonzo’s Quest 3D video slot at Bovada! The Gonzo’s Quest video slot features Avalanche Multipliers. Each spin you make on the Gonzo’s Quest slot machine is an “Avalanche.” If you get a winning combination, your wins will be multiplied by 1X and the symbols will then be removed from the screen. New symbols will now fall into place, if you get any winning combinations on the second fall, your wins will be multiplied by 2X. For the third fall, your wins will be multiplied by 3X. For the forth Avalanche and above, you will receive a 5X multiplier for your wins. In Free Falls mode, you will receive multipliers of 3X, 6X, 9X and 15X respectively. When three or more Free Falls symbols appear on a payline, you will win 10 Free Falls (or free spins). Additional Free Falls can be won during the Free Falls mode. You will receive increased Avalanche Multipliers of 3X, 6X, 9X and 15X during the Free Falls mode, so you will receive 3X what you would get during the regular slot game. Gonzo’s Quest has an autoplay mode that can be opened up by hitting the “Auto” button. You can play 10, 25, 50, 75, 100, 250, 500, 750 or 1000 autoplay spins at a time. In the advanced settings, you can set Gonzo’s Quest autoplay mode to stop on any win, if free spins is triggered, if the jackpot is won, if a single win exceeds (any amount you input) and if cash increases/decreases by (any amount you input). You can stop the autoplay mode at anytime on the Gonzo’s Quest online slot. Gonzo’s Quest is an original video slot with a unique 3D style that looks amazing. The Bejeweled style gameplay is not seen on too many video slots, so it is very much welcome here on the Gonzo’s Quest video slot. Also, the animated 3D Gonzo character on the left side of the screen that dances when you get winning combinations adds a level of fun to the slot game. You can play the Gonzo’s Quest video slot when you sign up and make a deposit at Bovada! 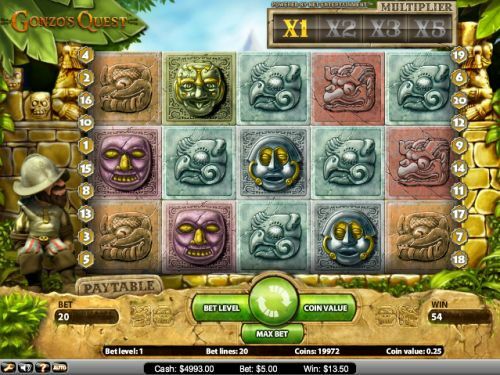 Can players from the USA play the Gonzo’s Quest online slot game for real money? Unfortunately, if you are from the USA, you cannot play the Gonzo’s Quest video slot for real money at this time. For a great selection of USA-friendly slots you can play, please visit Bovada Casino. Where can I play a flash version of the Gonzo’s Quest video slot? At the present time, you can’t play the Gonzo’s Quest slot game in a downloadable casino client, so the flash version is the only option currently available. You can play the Gonzo’s Quest flash game at Bovada. You can play for free or you can play for real money. If you experience any problems with the flash casino, make sure you have the latest version of Adobe Flash Player installed on your computer.